People are always asking how we came up with the name Joy’s House for our adult day service. We liked the comfort that came with visiting someone and the idea of what it takes to build a house. It made sense. Then came the second obstacle — choosing a name. We knew it was a “house,” but whose house was it? Then one day it just hit us — Joy! Not a person, but an amazing emotion. 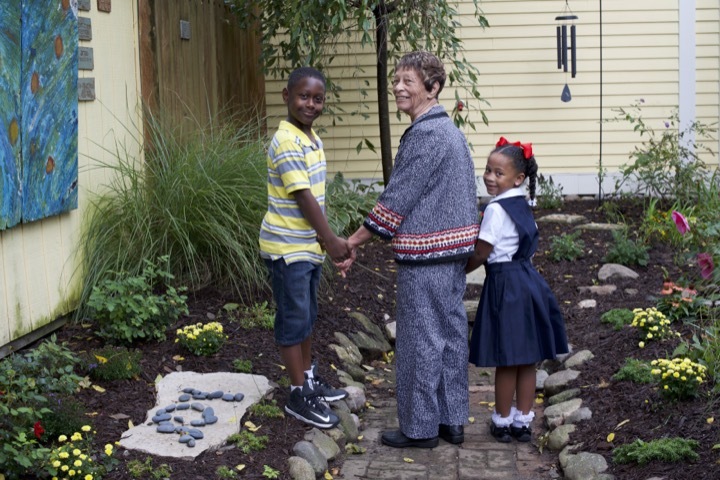 Miss Gurtis and her adorable grandchildren enjoying our secret garden in Broad Ripple. Located in the Broad Ripple area and on the south side of Indianapolis, Joy’s House was created from one woman’s dream, supported by family and friends, and has blossomed into a remarkable not-for-profit organization that provides physical, mental and financial relief for families caring for a loved one. Caregiving for a parent, spouse, family member or friend can be both wonderful and exhausting. What are you to do if you need to go to work, attend an appointment or simply take time for yourself? Adult day service is the perfect answer. Joy’s House serves adults living with life-altering diagnoses and their families by providing exceptional adult day and caregiver services. Joy’s House founder, Tina McIntosh, first became interested in the idea of opening an adult day service when she volunteered at a center in Muncie, Indiana as a freshman at Ball State University. One Master’s degree and ten years later, she found the courage to leave her successful job as an event planner and began the complicated process of opening a not-for-profit adult day center in 1999. As she shared her dream with others, she could see the passion grow inside of them. Before she knew it, people began to support her dream, and many formed the Board of Directors, Board Advisors and committee members for what we now know as Joy’s House. Together, they brought Tina’s dream to reality. With the help of donors, partners and volunteers in our community, we will continue to provide more than 10,500 days of service annually for adults living with a life altering diagnosis and more than 10,000 caregiving individuals in Greater Indianapolis annually. We are also working on the future of our UIndy location, our hopeful expansion to a third location in Hamilton County, and, as always, the best way to serve as many families as possible.